In southeast Syria, the 40,000-person Rukban camp went without an aid delivery for three months, finally receiving it around Feb. 7. Aid comes only twice a year to the residents, 80% of whom are women and children. The camp is controlled by the United States military and is trapped between Jordan and the US-backed rebel forces. Jordan, the Syrian government, and the US military have all contributed to the difficulty of getting food supplies, basic medicines, and education items to the camp; Jordan closed its borders in 2016 and the Syrian government has been blocking aid to force people to give into Bashar al-Assad’s rule. Beginning Feb. 9, the Syrian Democratic Forces, backed by the US, and Kurdish-led forces, made their “final push” to defeat the Islamic State by taking away the group’s remaining significant piece of land in the village of Baghuz in eastern Syria. Mustafa Bali, SDF spokesman, said that the offensive began after 20,000 civilians were evacuated, but many civilians likely remained in the region. SDF began its efforts to end IS presence in September that has resulted in hundreds of casualties on both sides. US-president Donald Trump claimed on Feb. 6 that he expects a formal announcement as early as next week that all IS-held land has been reclaimed. However, Trump’s comments, including his desire to withdraw troops from Syria by the end of April, is unnerving to other leaders European allies. German Chancellor Angela Merkel said that “We remain a long way from peace in Syria,” noting that “the so-called Islamic State has been luckily driven out of its territory but this unfortunately doesn't mean that Islamic State has disappeared.” Rather, she claims that it is being turned into an asymmetrical warfare force. As fighting continues in Syria, there must be a recognition that IS-affiliated militants remain in Afghanistan, Egypt, Libya, South-East Asia, West Africa, and Somalia. 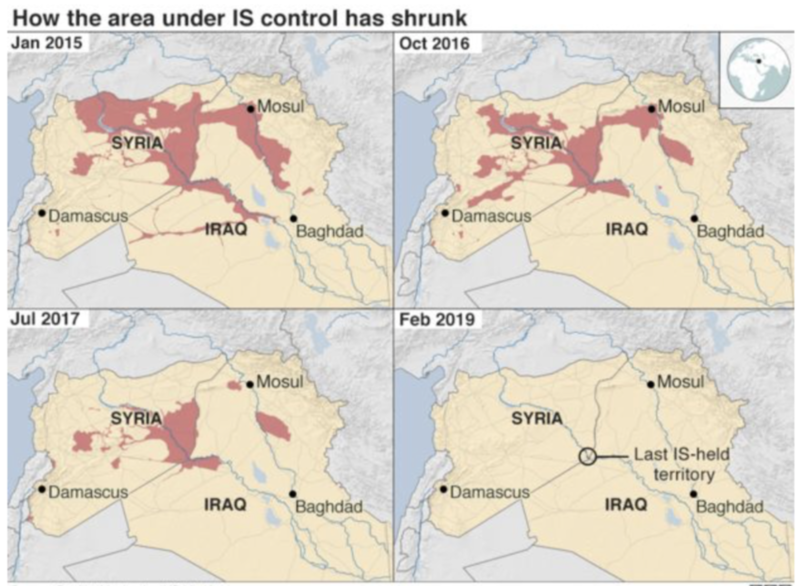 The BBC writes that IS still controls between 14,000 and 18,000 militants in Iraq and Syria alone. Even if SDF officially takes back all IS-controlled territory in Syria, IS will continue to have an ideological pull and a network of members across various countries. If military efforts continue, there must also be a simultaneous push for government and political stability, and improved living conditions for civilians to try to prevent a resurgence of IS fighting and attacks in Syria.